In a vintage week for Shapps watchers, I’ve experienced a mixture of horror, admiration and amazement at the antics of our esteemed housing minister. Take Thursday. 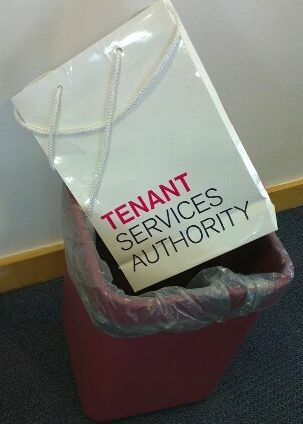 Shapps somehow found time in his busy schedule to find a bag from the Tenant Services Authority (TSA), put it in a bin, take a photo and then share it with his followers on twitter. The ‘binned’ tweet seemed overkill somehow for a quango that ceased to exist at the beginning of the month, rather like kicking your opponent when they are already down and, as Jon Land writes at 24Dash, ill-judged too. In fairness, he did have something to be pleased about. The launch of the self-build portal could be another small step towards achieving something important. If it really does help expand the output of self-build homes beyond the 13,800 apparently achieved last year – more than either Barratt of Taylor Wimpey managed – then that has to be good news. So here was the Admirable Shapps, the same face seen in his work on rough sleeping and honest admissions that house prices are too high. So perhaps we can forgive the self-congratulatory tone about all those TV celebrities – Kevin McCloud, George Clarke, Tommy Walsh, Dan Crucikshank, Tom Dyckhoff, Charlie Luxton and Michael Holmes (no, not sure who he is either) – even as we wonder where Nick Knowles and Sarah Beeny were. Maybe we can even forgive those faint echoes of Cool Britannia and those stomach-churning Downing Street receptions with Noel Gallagher. If all that plus the appointments of Mary Portas and Clarke as champions for high streets and empty homes give me a queasy feeling about government by celebrity, it’s no worse than Labour did with people like Alan Sugar. There’s the endless wriggling over the statistics on soaring private sector rents and housebuilding that’s emerged in yet more twitter spats with Labour’s Jack Dromey; a combination of Shameless Shapps and Comedy Shapps, yet with a self-belief that makes him immune to the impression he’s making in the wider world. And finally there’s the substance of the self-build announcement (curiously the name seems to have changed back from the ‘custom build’ used in last year’s housing strategy). How accurate are the stats on the size of the sector (a DCLG study last year concluded that ‘unfortunately, a considerable degree of uncertainty surrounds its size and role within the housing market’) and that claim about a 141 per cent growth in the self-build mortgage market over the next three years? How many of the self-built homes are additional supply and how many simply replace existing homes? How many of the self-builders are plucky 30s-style plotlanders and how many people like Wayne Rooney and other mega-rich footballers who demolish homes in city suburbs and build mega-mansions in their place? We don’t really know. Above all, while it’s good to see a housing minister back things like self-build and community land trusts, could he be doing more than hosting receptions and launching £30 million funds? The housing strategy included a case study of Almere, the new city in the Netherlands that includes a 100ha self-build zone. If the vague talk of garden cities in England really does turn into something, if there is strong backing for self-build and community land trusts as part of them, and if there’s encouragement for England’s mutual housing sector too, then we really would be talking. Until then, and while Shapps allows the rest of the DCLG housing agenda to be dictated by the big housebuilders, it is mostly just talk. In the meantime, the housing crisis continues to get worse. There is only one person in the country who believes he stands a chance of meeting his ‘Gold Standard’ of building more homes than Labour. The rushed launch of NewBuy is threatening to come back to bite him as big builders and lenders fall out with each other in public. And with every new initiative, every new scheme and every reheated announcement, the Cheshire Cat Shapps is slowly dissolving before our eyes, until he reaches the point where only the grin is left behind.